And this is why all of us in the SDR church see some in the SDA church coming against us with so much anger. We present the truth in its original form and because they have been indoctrinated to trust the edited writings in their corrupted form, they are naturally moved to hate us for presenting truth they believe to be a lie. And no, not all SDA's are like this. But the numbers of those that hate this truth are in fact growing. As i alluded to in my video titled "SDA Pastors caught LYING" the SDA leaders of today in unison with those that started this work many decades ago under the prophesied guidance of Rome, they have changed the original writings of Ellen White. In fact, with the exception of a few of her original titles, most of the books offered by the SDA church were never written by Ellen White at all. Yes, that means they lied when they claimed she approved of the books being offered and they lied when they stated she was the author of those books. As expected every SDA church today offers only the edited writings when selling these books to their church members as well as those they distribute to the lost souls around the world. Need I remind you of the great counterfeit called the "Great Hope" that SDA President Ted Wilson sent out that purposely hid the facts about the Popes of Rome and their long prophesied plans of attack on those that claim Christ Lord in the coming days? That all being said, what of the remnant OF the seed that prophecy says will only follow the Lamb withersoever He goeth? (See Revelation 12:17 & 14:4) What books would we recommend when moved to share with those in need? The original ones of course. As we see here, the remnant people that leave the SDA church will be used of God to share the unchanged books as God intended. Now I don't think it is necessary to show all the changes the SDA leaders made in the Spirit of Prophecy as that would take days on end. I am current awaiting the arrival of the book Vern Bates made wherein he outlines the changes made in the 1884 Great Controversy and I am sure more videos will be the end result. Suffice it to say all one needs to do is buy the original books from vbates.com and compare them with what they got from the SDA church the last 100 years. In any event, if you look into this, you will discover that just as the Vatican altered the Bibles to hide the truth about the Popes and their dying god Satan, the SDA leaders are doing the exact same thing with the writings of Ellen White to hide how Rome has taken the SDA church so as to ready a people to worship Antichrist instead of The true Christ. "In 1992, the Review revealed the practice of the staff of the White Estate in revising and altering the writings of Ellen White. Paul A. Gordon, then secretary of the White Estate, writes: Is it legitimate to change, abridge, or simplify Ellen White's writings? The answer is yes. We can change, abridge, or simplify the words, but we do not have license to change the intended message. Here's why: Seventh-day Adventists do not hold to verbal inspiration. That means we do not believe that God dictated the words for Ellen White to use. … In the years since Mrs. White's death in 1915, more than 50 new compilations or editions of Ellen White's books have been prepared by the E.G. White Estate. In every case–including editions that have been abridged, condensed, or simplified–the intended message has never been lost, only the wording has been changed." –Paul A. Gordon, Adventist Review, Nov. 19, 1992, pp. 8-9. "On this path the Advent people were travelling to the City… Others rashly denied the light behind them, and said that it was not God that had led them out so far. The light behind them went out leaving their feet in perfect darkness, and they stumbled and got their eyes off the mark and lost sight of Jesus, and fell off the path down in the dark and wicked world below. It was just as impossible for them to get on the path again and go to the City, as all the wicked world which God had rejected. They fell all the way along the path one after another, until we heard the voice of God like many waters, which gave us the day and hour of Jesus' coming." -A Word to the Little Flock page 15. "(DELETED) Others rashly denied the light behind them and said that it was not God that had led them out so far. The light behind them went out, leaving their feet in perfect darkness, and they stumbled and lost sight of the mark and of Jesus, and fell off the path down into the dark and wicked world below. (DELETED) Soon we heard the voice of God like many waters, which gave us the day and hour of Jesus' coming." –Early Writings, p. 15, 1882. No mention at all as to the final and unforgiveable position of those that left the path because leaving those words in from the original book would mean their Vatican echo of staying with the church to be saved all the way till the end could not be used. The people are taught they can stay in the church and still be blessed, even though Jesus said the remnant will come out. If that statement was left in the honest SDA brethren would eventually seek to repent and better prepare for the coming of the Lord. In so doing, their study of the Word and Spirit of Prophecy would bring them to realize they need to leave the church. They will find their leaders lied when they said to stay with the ship. But their Christian duty is to "follow the Lamb withersoever He goeth." (Revelation 14:4) But the SDA church rejected the 1888 message that declared it is Christ our righteousness and so Jesus is no longer in the SDA church. And for those that ignore their Bibles on this, there are 336 statements from Ellen White endorsing the 1888 message so as to help the people of God learn the truth. As the 501c3 Government Contract with the second beast of Revelation confirms (The USA) the SDA leaders are more concerned with the cash they make than the precious souls under their care and so they will most assuredly lie to keep them in the pews. And so to keep the blog/video short, notice this final point.. If you have the Published Writings of Ellen G. White on DVD. Search for the book "A Word to the "Little Flock" (Query = WLF) Notice that after scrolling through some comments from the trustee of the Ellen White Estate, we see that little booklet actually starts on page 12. They didn't even hide their deleted pages by renumbering the book. Now check the original copy of that very same book. I have it online here. Notice what's covered on those missing 12 pages. That's right! It's all about what will happen very soon regarding the time of trouble, which has already started in our day and then the plagues and the final time of Jacob's trouble. The Jesuits in the SDA church and those in bed with them in the General Conference that are controlling the SDA church do not want you to be ready for the return of Christ. No getting around the fact that they purposely removed those first 12 pages. And so you need to get a copy of this book from vbates.com and read those 12 pages to be better prepared for what's already begun. It is the prayer of the Seventh Day Remnant people all over the world that when you read the original books that you will come to realize that just as Scripture and the Spirit of Prophecy declared long ago, the remnant people of God are those that COME OUT of the SDA church and not those that stay in. NOTE: "I have my work to do, to meet the misconceptions of those who suppose themselves able to say what is testimony from God and what is human production. If those who have done this work continue in this course, satanic agencies will choose for them." 3 SM 70. And so he has, and they are now called The General Conference of the Seventh Day Adventist Church. Yes, the SOP does state, "The very last deception of Satan will be to make of none effect the testimony of the Spirt of God." This is already happening in the SDA churches. The SOP is no longer preached. 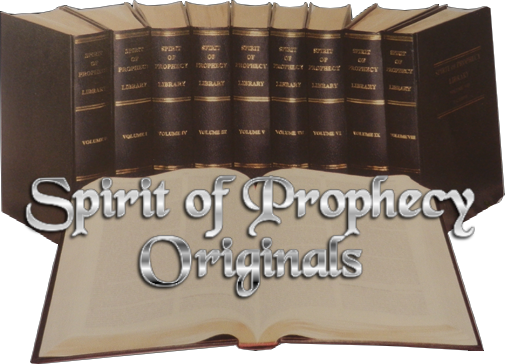 Rev 19:10 " for the testimony of Jesus is the spirit of prophecy." I know not the motive of others, I can only proclaim the message as the Holy Spirt leads me, and the SOP is a very important study. There are many books available today. The Great Controversy ,The Conflict of the Ages, Testimony for the Churches, The Spirit of Prophecy, to name a few, plus so many more! "If any man will do his will, he shall know of the doctrine." John 7:17. As a " Seventh Day Sabbath believer" not a "Saturday keeper" we should think on this verse: "Wherefore I will not be negligent to put you always in remembrance of these things though ye know them, and be established in the present truth." 2 peter1:12. These pillows of our doctrine can be found in the KJV Bible, as well as in the Spirt of Propercy books. If any church is not teaching these messages, it's time to leave, for this is our foundation. Time is to late to be concerned about changes. We need to know what we believe! Wonderful books to give out are: The Ministry of Healing and The Great Controversy. ( not the great hope.) We must evangelize with the books we have while it is still day! Problem is dear one is that the Great Controversy of the today is a counterfeit. Get a copy of the 1858 Great Controversy here… http://vbates.com/cgi-bin/imcart/display.cgi?item_id=egw07&cat=1&page=1&search=&since=0&status=&title= and compare it with the 1911 (and later) versions of the Great Controversy and you will see to preach from the SDA versions would be to echo that which the Vatican has penned and not Sister White. The SDA church has changed her writings. Worse yet they have printed over 50 compilations of her writings with many additions and removals in them while claiming she not only approved, they claimed she authored them. I have a Facsimile copy of A Word to the Little Flock, and on page 1, James White says the following articles were written by O R L Crosier. The EGW program only has Mrs White, not the other writers. It mentioned that she wrote 12? Pages of this pamflet. That is all they have. It's not all by EGW. So this is a poor example to bring out, I believe. I would not trust anything the SDA church has placed in these books. They lied when they said sister White approved more than a few times. I have the original book on its way to me in the mail and i have the original book on the site. Those 12 pages are indeed missing and they didn’t even try to renumber the pages to hide their deception. A d the original books was penned by James AND Ellen White as well as Joseph Bates.